Chronic Pain: Unpleasant sensory and emotional experience arising from actual or potential tissue damage or described in terms of such damage (International Association for the Study of Pain); sudden or slow onset of any intensity from mild to severe, constant or recurring without an anticipated or predictable end and a duration of greater than six (6) months. Chronic pain is often described as any pain lasting more than 12 weeks. The pain may be classified as chronic malignant pain or chronic nonmalignant pain. Malignant pain is linked top a particular cause like cancer. In nonmalignant pain, the original tissue injury is not progressive or has been healed but the patient still experiences pain. Chronic pain can be mild or excruciating, episodic or continuous, merely inconvenient or totally incapacitating. Eventually, it becomes more difficult for the patient to differentiate the exact location of the pain and clearly identify the intensity of the pain. Some may suffer chronic pain in the absence of any past injury or evidence of body damage. It may limit the person’s movements, which can reduce flexibility, strength, and stamina. This difficulty in carrying out important and enjoyable activities can lead to disability and despair. Family members, friends, co-workers, employers, and healthcare providers question the legitimacy of the patient’s pain reports because the patient may not look like someone in pain. The patient may also be involved of using pain to earn attention or to avoid work, commitments, and responsibilities. The emotional toll of chronic pain also can make pain worse because of the mind-body links associated with it. Effective treatment requires addressing psychological as well as physical aspects of the condition. Patient reports pain at a level less than 3 to 4 on a 0 to 10 rating scale. Patient uses pharmacological and nonpharmacological pain relief strategies. Patient verbalizes acceptable level of pain relief and ability to engage in desired activities. Patient engages in desired activities without an increase in pain level. Thorough assessment of Chronic Pain is necessary for the development of an effective pain management plan. Nurses play a significant part in the assessment of pain, owing to the nature of their relationship with patients. Patient’s self-report is the most reliable information about the chronic pain experience. Assess and note for signs and symptoms related to chronic pain such as weakness, decreased appetite, weight loss, changes in body posture, sleep pattern disturbance, anxiety, irritability, agitation, or depression. Physiological changes and behaviors associated with acute pain may not be exhibited by patients with chronic pain. The guarding behavior of acute pain may become a persistent change in body posture for the patient with chronic pain. Coping with chronic pain can reduce the patient’s energy for other activities. Assess the patient’s perception of the effectiveness of techniques used for pain relief in the past. Patients with chronic pain have a long history of using various pharmacological and nonpharmacological means to control and alleviate their pain. Evaluate factors such as gender, cultural, societal, and religious features that may influence the patient’s pain experience and reaction to pain relief. Recognizing the variables that influence the patient’s pain experience can be instrumental in developing a plan of care that is acceptable to the patient. Assess the patient’s beliefs and expectations about pain relief. Patients with chronic pain may not anticipate complete relief of pain but may be satisfied with diminishing severity of the pain and increasing activity level. Evaluate the patient’s approach towards pharmacological and nonpharmacological means of pain management. Patients may perceive medications as the only effective treatment to alleviate pain and may question the effectiveness of nonpharmacological interventions. Know more about side effects, dependency, and tolerance (including alcohol) of patients taking opioid analgesics. Drug dependence and tolerance to opioid analgesics are concerns in the long-term management of chronic pain. Determine patient’s current medication use. Obtain a medication history to aid in planning pain treatment. Evaluate the patient’s ability to perform and fulfill activities of daily living (ADLs), instrumental activities of daily living (IADLs), and demands of daily living (DDLs). The person’s ability to complete self-care activities and fulfill role responsibilities can be limited by exhaustion, anxiety, and depression linked to chronic pain. Allow patient to maintain a diary of pain ratings, timing, precipitating events, medications, treatments, and what works best to relieve pain. Systematic tracking of pain appears to be an important factor in improving pain management. Recognize and convey acceptance of the patient’s pain experience. Conveying acceptance of the patient’s pain promotes a more cooperative nurse-patient relationship. Aid the patient in making decisions about choosing a particular pain management strategy. The nurse can increase the patient’s willingness to adopt new interventions to promote pain relief through guidance and support. The patient may begin to feel confident regarding the effectiveness of these interventions. If the patient is receiving parenteral analgesia, use an equianalgesic chart to convert to an oral or another noninvasive route as smoothly as possible. The least invasive route of administration capable of providing adequate pain control is recommended. The oral route is the most preferred because it is the most convenient and cost effective. Avoid the intramuscular (IM) route because of unreliable absorption, pain, and inconvenience. Allow the patient to describe appetite, bowel elimination, and ability to rest and sleep. Administer medications and treatments to improve these functions. Always obtain a prescription for a peristaltic stimulant to prevent opioid-induced constipation. Because there is great individual variation in the development of opioid-induced side effects, they should be monitored and, if their development is inevitable (e.g., constipation), prophylactically treated. Opioids cause constipation by decreasing bowel peristalsis. Obtain prescriptions to increase or decrease analgesic doses when indicated. Base prescriptions on the patient’s report of pain severity and the comfort/function goal and response to previous dose in terms of relief, side effects, and ability to perform the daily activities and the prescribed therapeutic regimen. Opioid doses should be adjusted individually to achieve pain relief with an acceptable level of adverse effects. If opioid dose is increased, monitor sedation and respiratory status for a brief time. Patients receiving long-term opioid therapy generally develop tolerance to the respiratory depressant effects of these agents. Educate patient of pain management approach that has been ordered, including therapies, medication administration, side effects, and complications. One of the most important steps toward improved control of pain is a better patient understanding of the nature of pain, its treatment, and the role patient needs to play in pain control. Discuss patient’s fears of undertreated pain, addiction, and overdose. Because of the various misconceptions concerning pain and its treatment, education about the ability to control pain effectively and correction of myths about the use of opioids should be included as part of the treatment plan. 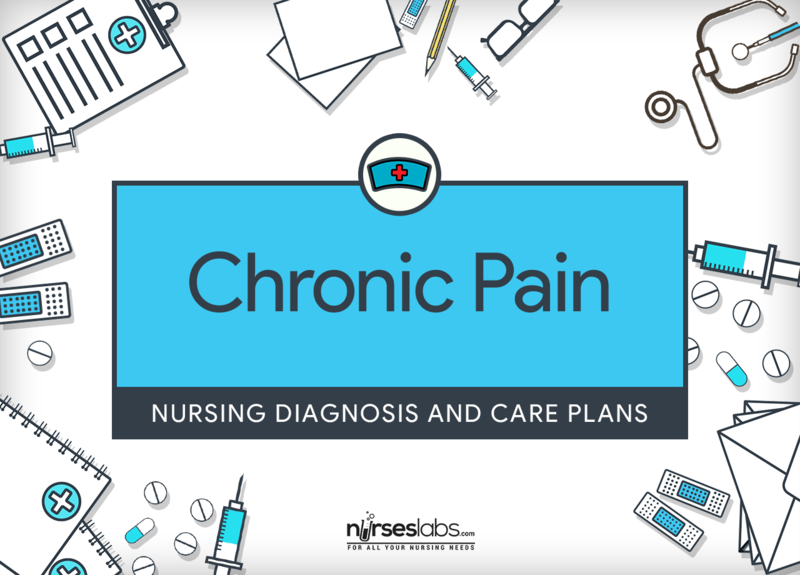 Review patient’s pain diary, flow sheet, and medication records to determine overall degree of pain relief, side effects, and analgesic requirements for an appropriate period (e.g., one week). Systematic tracking of pain appears to be an important factor in improving pain management. Maintain the patient’s use of nonpharmacological methods to control pain, such as distraction, imagery, relaxation, massage, and heat and cold application. Cognitive-behavioral strategies can restore patient’s sense of self-control, personal efficacy, and active participation in their own care. Implement nonpharmacological interventions when pain is relatively well controlled with pharmacological interventions. Nonpharmacological interventions should be used to reinforce, not replace, pharmacological interventions. Plan care activities around periods of greatest comfort whenever possible. Pain diminishes activity. Examine relevant resources for management of pain on a long-term basis (e.g., hospice, pain care center). Most patients with cancer or chronic nonmalignant pain are treated for pain in outpatient and home care settings. Plans should be made to secure ongoing assessment of the pain and the effectiveness of treatments in these settings. If patient has growing cancer pain, assist patient and family with managing issues related to death and dying. Support groups and pastoral counseling may improve the patient’s and family’s coping skills and give needed support. If patient has chronic nonmalignant pain, help patient and family in lessening effects of pain on interpersonal relationships and daily activities such as work and recreation. Pain lessens patient’s options to exercise control, diminishes psychological well-being, and makes them feel helpless and vulnerable. Therefore clinicians should support active patient involvement in effective and practical methods to manage pain. Validate the patient’s feelings and emotions regarding current health status. Validation lets the patient know the nurse has heard and understands what was said, and it promotes the nurse-client relationship. Refer the patient and family to community support groups and self-help groups for people coping with chronic pain. This is to reduce the burden of suffering associated with chronic pain and provides additional resources like patient’s support network. Refer the patient to a physical therapist for assessment and evaluation. This is helpful to promote muscle strength and joint mobility, and therapies to promote relaxation of tense muscles, the physical therapist can help the patient with exercises suitable for his/her condition. These interventions can influence the effectiveness of pain management. Provide the patient and family with adequate information about chronic pain and options available for pain management. Lack of knowledge about the characteristics of chronic pain and pain management strategies can add to the burden of pain in the patient’s life. Acupressure is a pain management strategy which employs finger pressure applied to acupressure points on the body. Using the gate control theory, the technique works to interrupt pain transmission by “closing the gate.” This approach requires training and practice. Cold application diminishes pain, inflammation, and muscle spasticity through vasoconstriction and by limiting the release of pain-inducing chemicals and regulating the conduction of pain impulses. This intervention is cost effective and requires no special equipment. Cold applications should last about 20 to 30 min/hr or depending on the patient’s tolerance. Distraction is a pain management approach that works briefly by increasing the pain threshold. It should be utilized for a short duration, usually less than 2 hours at a time. Prolonged utilization can add to fatigue that may lead to exhaustion and may further increase pain when the distraction is no longer present. Heat application lessens pain through vasodilatation that causes enhanced blood flow to the area and through reduction of pain reflexes. This demands no special equipment and also cost effective. Heat applications also depend on patient’s tolerance but should last no more than 20 min/hr. Special attention needs to be given to preventing burns with this intervention. Massage suspends pain transmission by boosting the release of endorphins and decreases tissue edema. This intervention may require another person to provide the massage. Progressive relaxation technique, guided imagery, and music therapy. These pain management methods are centrally acting that works through reducing muscle tension and stress. The patient may feel an increased sense of control over his/her pain. Guided imagery can aid the patient to explore images about pain, pain relief, and healing. These techniques require practice to be effective. Transcutaneous Electrical Nerve Stimulation (TENS) TENS utilizes the application of 2 to 4 skin electrodes. Pain reduction happens when a mild electrical current passes through the electrode then onto the skin. The patient is able to regulate the intensity and frequency of the electrical stimulation that depends to his/her tolerance. These drugs are also beneficial addition in a total program of pain management plan. Its effects are the same with anti-depressants. These drugs may be helpful adjuncts in a total program of pain management. In addition to their effects on the patient’s mood, the antidepressants may have analgesic properties apart from their antidepressant actions. These drugs are the primary step in the analgesic ladder. They go by inhibiting the synthesis of prostaglandins that cause pain in peripheral tissues, inflammation, and edema. The advantages of these drugs are not associated with dependency and addiction and they can be taken orally. These drugs lessen pain by binding with opiate receptors throughout the body. They work on the central nervous system so the side effects associated with this group of drugs tend to be more significant that those with the NSAIDs. The main concern in patients using these drugs for chronic pain management are nausea, vomiting, constipation, sedation, respiratory depression, tolerance, and dependency.